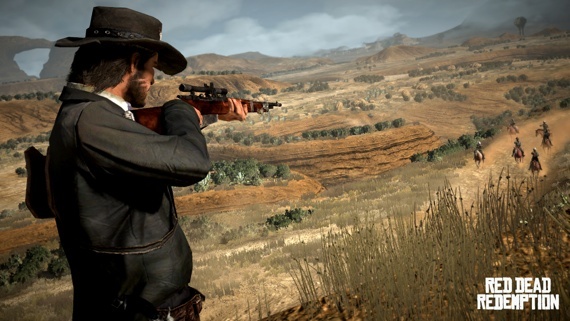 Designing Sound: What were the audio direction meetings about when Red Dead Redemption started? How was communication between sound and the other dev. teams? Jeff Whitcher: The direction was established right from the start that we were going to cover the life and sounds of the old west as authentically as possible. All of the different departments are meticulous in their research and the audio team was able to glean quite a bit from the art department, in particular. Once we started seeing sketches and other art work, we were blown away with the level of detail and that gave us the impetus to work that much harder on the sound track. Audio had great communication with all of the other disciplines through out the development period. We were afforded tremendous support in getting the tools and systems in place into which we would tap to hook up various audio behaviors. Our audio programmers are some of the most talented and intelligent people with whom I have ever worked. 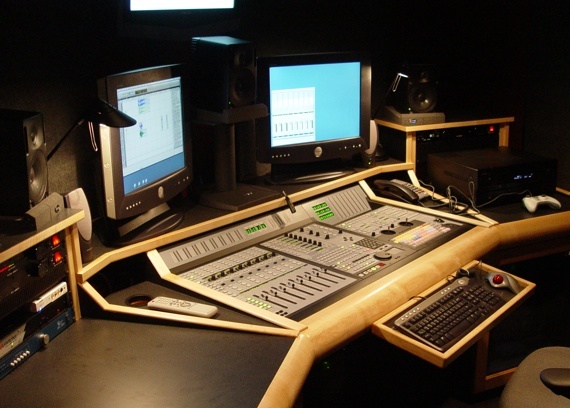 Often times, the sound editors would present ideas we wanted to achieve and our programmers made realizing those ideas an effortless reality. DS: Being a sequel to Red Dead Revolver, what did you want to do differently audio-wise? 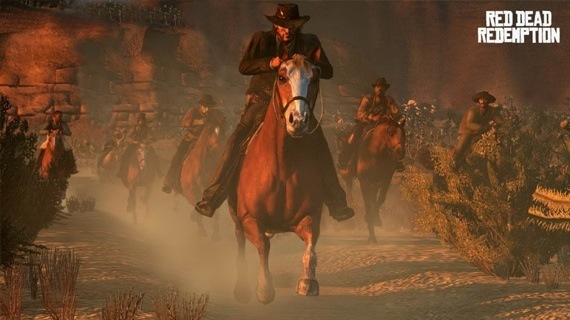 JW: Obviously the scope of Red Dead Redemption far exceeds what we accomplished in Red Dead Revolver. However, at the core of both games, the focus was always the most immersive and fun experience for the player. This time around, the story, the amount of characters, the music, the open world, everything was grander, to say the least. The interactive score continues to blow me away; that system provides such a fresh experience every time the game is played. The amount of content, and not just audio, that we were able to deliver in this title is unbelievable. The management of information – tracking the flow and implementation of content – was absolutely critical during the design and development phase of this project. DS: There are some gameplay/engine similarities with the Grand Theft Auto series. How did it affect the sound in RDR? JW: In developing this open-world game, it was wonderful to have some of the systems and support from other Rockstar facilities; in particular, Rockstar North. Their input and guidance was invaluable to achieving the soundscape we were able to accomplish. The ambience system, for example, is so rich and flexible, it allowed us to focus on a level of detail we never would have imagined. There are unique ambiences for each of the three main regions in the game. Inside those regions, ambiences are further broken down and some things like bugs, birds, and other animals, are further refined to respect things like weather and time of day. It was literally a sound designer’s dream to have that level of flexibility and detail in which to aurally sculpt. Also, RDR and GTA are built upon Rockstar’s Rage engine, and the Rage Audio component is a tremendously advanced piece of audio middleware. It gives us the tools to create huge and extremely complex audio assets with ease, across both platforms, and puts an incredible amount of power into the hands of sound designers, freeing up the audio programmers to work on custom game features. The same tools being used across studios also means it’s very easy to share techniques and tricks with the other teams. DS: How did your team approach designing ambiences and backgrounds for all this amazing wild west landscape? JW: Every area in the world was looked at from an ambience perspective – what kind of place is this? Is it foreboding? Is it serene? What types of wild life inhabit this area? One area in particular for me, an area I relished crafting the ambience, was Thieves Landing. My instruction was to make this place creepy; the kind of place in which you do not want to be. That afforded me some artistic license with some of the wildlife to think outside the box. You take the staple elements you need at a swamp – insects, frogs, etc – and then you add some off-putting sounds. What was that? Is that a bird? Or a bug? Whatever it was, it freaked me out! That type of audio work is always great fun. George Williamson at Rockstar North did some amazing work with the ambience system. His attention to detail was invaluable on this project. Everything was always organic in the ambience, but it was crafted in such a way to trigger an emotional reaction; hopefully, in the case of Thieves Landing, one that is creepy. Also, ambiences were used to set the tone and vibe for each area. While there is ambient music, and it is wonderful music through and through, we also wanted to have the wildlife dictate the tone of each place. An easy example is the use of flies around all of the out houses. Obviously, flies sell stench and decay. By putting a rooster in the morning hours at the ranch house, you paint a tranquil audio picture. Venture out a little ways and start hearing crows or jackdaws and you’re not quite sure what to expect….could be trouble. The overall idea was to always have something going in the ambient world to keep a sense of “life” throughout the world. DS: Being a period action game, authentic weapon sounds are paramount. How did this affect the way you designed sounds for the player’s arsenal? JW: When it comes to weapons, you always have to ensure a payoff for the player. From the foley approach, we recorded authentic weaponry actions – holstering, chambering, loading, etc. And, to some extent, certain elements of authentic weapon firing were used as pieces for the composite shots. However, a completely literal approach to weapon firing would never satisfy the player. When the player fires his or her weapon, they want to “feel” something in the shot. Thus, no single weapon is made up of simply one effect for the bang or boom; it’s always a composite of several elements, layered to work together. Early on, the audio team met with some of the designers and talked extensively about the different weapons. We wanted to make sure that each weapon was unique as well as each “level” of weapon was better than its precursor; again, going back to the “payoff” for the player. As you progress through the game and get better armaments, we wanted the player to be satisfied with each new acquisition. One of our senior sound designers here at Rockstar San Diego, Steven von Kampen, headed up all of the weapons design. Steven always does a lot of research and critical listening, especially in the area of weapons. And with his knowledge and skill, he can take the input of the designers and create sounds that far exceed expectations. Additionally, a good deal of planning went into how the weapons were pieced together – the different components of each shot – and how the weapons behaved in the world.To support this, we had a system that allowed us to tune things like the report of a gun – the echo that travels through the canyons – as well as slap back from an adjacent rock or cliff face. We additionally focused on ensuring directionality of enemy gunfire. We did not want the player to be frustrated in a gunfight because they could not tell from where an enemy was firing. I am quite pleased with how the weapons are balanced in the mix; they cut through the frequency spectrum yet they do not overpower the listener and create ear fatigue. End goal: it’s simply good fun to fire them guns! DS: I think the foley production for this game would’ve been daunting. Lot of movement, different surfaces, horses riding all the time, etc. What was your approach to foley and field recording for RDR? JW: Foley on this game was an enormous project. It began with a week-long foley session during which time I had two foley artist colleagues come down from Los Angeles. I sent them throughout Hollywood prop houses to gather anything and everything western-related and they delivered. I spent several days with them in the studio here recording thousands of sounds. We built a library of material just for this game comprised of every kind of leather, saddle, creak, snap, break, smash, rattle, you name it. They were exhausted by week’s end. Once we had this enormous library from which to create, we went through thousands of animations to tag up all of the various sounds. Our focus was to provide as much detail in not only all of the human characters – walking, sitting, standing, interacting – but also the props and vehicles. Our foley artists really came through in their acquisitions as we were able to cover all the jingles and rustles and the myriad of sounds needed to blanket the world. Corey Ross, another sound designer here at Rockstar San Diego, spent a great deal of time sifting through the myriad of material we recorded and constructing all of the props and breakable sounds for the game. 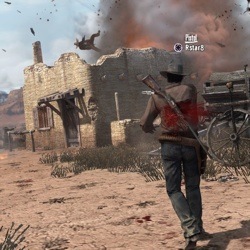 DS: A very interesting in-game feature is The Dead-Eye targeting system. How did you approach the sound for this system conceptually? JW: The main approach to DeadEye was to make it cool. Subjective elements are always fun as it allows us the creative freedom to create that which does not naturally exist. The trick becomes to keep it sounding organic and not sci-fi or electronic. Once we had established beds and tones which we felt would meet the objective, the next step was to implement them with behaviors that allowed those tones to be sculpted and manipulated in real-time during gameplay. Also, another very important aspect of DeadEye is what happens to the other sounds in the game. Thus, various pitching and filtering parameters are employed to help “slow down reality” and complete the effect. 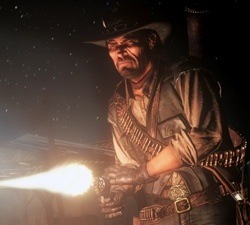 I tip my hat to another sound designer here at Rockstar San Diego, Christian Kjeldsen, who was chiefly responsible for the Dead Eye audio. Christian is our resident guru with all sorts of software tools and tricks and never fails to create outstanding sounds. DS: Hunting in the game is a great experience, was it as fun to design as it is to play? JW: Animals were quite a challenge for me as some of them are so complex in their vocabulary. We spent a great deal of time working out the mechanics of the horse footsteps, for example, and it took a great deal to get their different rhythms to sound natural. There is an old adage amongst picture editors and sound editors that the best work will often go unnoticed; you do not want to pull the player or the viewer out of the experience and call attention to your work. You want them to be immersed in the experience. When correct, natural sound happens, it just goes by and does not call attention to itself. And upon that I focused the design of all the animals. Because horses were so ubiquitous throughout the game, they needed to have the most variety in their vocabulary – knickers, snorts, whinnies, breaths, etc. – and within each of those categories, variations needed to be assembled to work cohesively. Thus, some time was spent equalizing and balancing a vast amount of animal material so that everything blended. DS: With the huge amount of dialogue in the game, how did you handle it all from recording to implementation? DS: Great dialogue always starts with a great story and Dan Hauser and his team of writers delivered above and beyond for this project. The team in New York handled the hiring of the actors and the thousands of hours of recording and made my job of implementation such a breeze. Once the edited and named files were delivered, we and the dialogue team at Rockstar North ran everything through a batch EQ and leveling process, to ensure uniformity across the almost 90 thousand lines. Again, the team in New York and I kept a diligent tracking sheet to manage the workflow. When I first heard the numbers early on about the amount of speech material I was, I admit, a tad overwhelmed. However, once things started rolling in, the New York team made the process so smooth and effortless, that my apprehensions were quickly put at ease. It was a dream system. It really boils down to having a solid story with rich dialogue, uniformity amongst the recording and mastering process, and countless hours updating and managing your excel files. DS: I loved the sound mix of RDR. How was it approached? Also, what kind of audio implementation tools were used? JW: Our main audio tools are Pro Tools systems loaded with wonderful plug ins, Wavelab, Sound Forge, Native Instruments programs, and a proprietary set of tools developed by our in-house wizards. One aspect that was especially terrific about this project was the support from all of the audio programmers. It’s one thing to create some great sounds on your workstation, but then getting those sounds into the game and getting those sounds to behave properly in the world is a major part of completing one’s design. The designers could mock things up in Pro Tools or Reaktor, for example, and the audio programmers could then adapt all of the various behaviors and modulations within the code to realize our desired goals with different sounds. When it came to the final mix, several factors came into play to get everything balanced. Throughout a major portion of the development of the project, I spent a good deal of time monitoring on the television set in my studio. I only went to the high-end reference monitors after I had a satisfying playback off of the television set. Secondly, we have an area in our audio department that is set up similar to a consumer home theater system. The audio team, including the programmers, met weekly to play through the game on the consumer surround system as well as the television monitor in that home living room space. Finally, I worked closely with my fellow lead sound designer Matthew Smith on the final balancing and blending of the three main aspects of the sound track: speech, effects, and music. Matt was able to code up some terrific systems to keep the mix dynamic; this was critical for me. I did not want the soundtrack to be one, flat level throughout the entire game play experience. We were able to give the player a completely dynamic experience that really breathes with highs and lows and nice movement. Games are so interactive, you cannot approach the mix as you would a feature film, which is completely linear. So many things can happen at different times in the game that affect how the sound behaves. Thus, we had to make sure the audio mix always adapted, at run time, to whatever was happing in the game. This ensured we would never have music step on speech intelligibility or sound effects get lost during critical game play moments. I would be remiss if I did not mention the amazing programming support from the audio programmers. Rob Katz, Corey Shay and Alastair MacGregor in particular were key players in bringing this audio to life. Sound designers can never fully appreciate the value of quality programming support. Without them, our wave files are simply disembodied sound files; programming connects those sounds to be part of the game. DS: Finally, could you tell us something about your relationship with the composers? What are your thoughts on an “in-game score vs full song soundtrack”? JW: I really love the music in this game and truly feel the musical soundtrack completes the aural experience. A proprietary system was developed in-house to make sure the score was vividly dynamic, spacious, and always complementary to the events in game. The composers truly delivered something incredible. I have spent so many hours with the game and the score continues to knock my socks off. Each of the three main areas has its own unique flavor of music, yet it all works so seamlessly together. 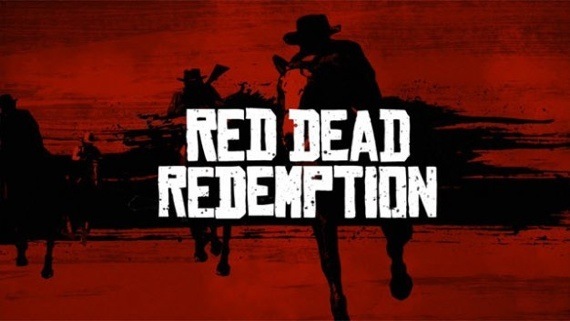 The interactivity of the score was vital, and Craig Conner and Rebecca Johnson at Rockstar North specified and hand-tuned almost 1000 individual musical transitions in the main single-player missions alone, which the game designers would then weave into the scripting of their missions, “directing” musical moments to accentuate the game play experience for the player. The music system was able to cue off of that and then constantly evolve and randomize itself to further keep the soundtrack fresh and interesting. All in all, the creation of this game was an amazing experience and a sound designer’s dream. Red Dead’s audio is indeed truly spectacular. Props to everyone on the team for a job well done. Great interview Miguel, and big props to the RDR sound team. Great job RDR team, and fantastic interview! Hat tip to the folks who wrote all those lines, too! It really blew me away when I replayed a mission I had died in, and during, say, the horse ride out to the mission itself, the characters had a different conversation!